IMS Global Learning Consortium’s (IMS Global) mission is to foster collaboration between educators, learners, and education technology providers by removing barriers to learning and promoting common, interoperable architectures. IMS Global has an extensive history of enabling accessibility in learning technology. This paper provides curated information on accessible online learning as it pertains to IMS Global interoperability standards. Areas of focus include the personalization of resources, interfaces, and content to meet the needs of all individuals. IMS Global believes that the best way to make a system or resource accessible to an individual is by meeting that individual’s particular needs at that time in that context. Doing so not only decreases exclusion but also increases usability for everyone. Creating an inclusive experience is a potentially effective way to meet legal accessibility requirements in many jurisdictions and expands the market of potential customers and users. Enhancing Accessibility through IMS Global Standards is a primer for anyone in the higher education and K–12 communities interested in connecting accessible learning within their system of educational platforms and applications. Software developers and solution providers can utilize IMS Global standards for faster implementation and to meet integration requirements. IMS Global provides open architecture standards allowing full collaboration across institutions and third-party providers. Each of the standards supports many accessibility features within those delivery systems. Accessibility legislation seeks to remove barriers to the online learning experience. The legislation is based on the W3C WCAG 2.0 guidelines and informed by independent international standards experts. Websites can be designed to be more accessible by their conformance to standards and best-practice design principles. This may include accessibility features such as tabbing, navigation and alternative text for images. Interoperability is the ability of a system or a product to interconnect with other systems and products. IMS Global’s AccessForAll® (AfA) Personal Needs & Preferences specification gives each user the ability to select personal accessibility needs and preferences and to control the release and presentation of that information within those systems. Products and services that have inclusive design are accessible and usable by all without special modification or design. The assessment process also includes determining specific learning needs and defining the end goal of instruction in order to create assessments that assist in the student’s success. The laws, policies, and practices governing equal rights, access to education, and accessibility as it relates to Information and Communications Technology (ICT) are varied and complex. Although some international groups have attempted to create common policies, such as the European Union’s Charter of Fundamental Rights, most nations have laws that influence the everyday practices of individuals, companies, and institutions. That being said, many nations are aligning their legislation regarding fair and inclusive access to ICT with the Web Content Accessibility Guidelines (WCAG 2.0) published by the W3C’s Web Accessibility Initiative. This movement towards shared ICT standards is critical for ensuring universal, interoperable solutions as well as an economic, political, and social commitment to inclusive experiences at a global scale. These principles have also been widely applied to other environments, including education. The IMS Global guidelines are connected to the W3C’s ICT policies as global learning opportunities rely heavily on ICT access and innovation. How Do IMS Global Standards Enhance Accessibility for Students? Creating standards for specific learner needs and preferences provides an inclusive educational experience. The IMS Global Accessibility workgroup focuses on adaptation or personalization of resources, interfaces, and content to meet the needs of individual learners. The group believes the best way to make a system or resource accessible to an individual is by meeting an individual’s particular needs immediately within the learning context. Doing so decreases exclusion, and increases usability for everyone. IMS Global has many ongoing initiatives involving the integration of accessibility requirements within interoperability standards across enterprise systems and applications. AccessForAll is an IMS Global workgroup focused on matching resource characteristics (metadata) to individual user needs. In circumstances where resources might not be suitable for all users, it enables the discovery of other appropriate resources. AccessForAll's approach emphasizes personalization by providing support for transformable, flexible systems that meet different needs. AccessForAll accessibility is often just-in-time accessibility and, significantly, supports cumulative accessibility of resources as third parties create and associate alternatives to original resources. Together, the many resources in a system contain the features or educational materials that every student needs, but no single resource has to be 100% accessible to all learners. Most resources will likely be accessible to most students. By creating AccessForAll metadata about each resource, it is easier to determine which resources might need to be adapted to meet particular students' needs. AccessForAll includes a standard way or common language to describe a user's needs and preferences, the Personal Needs & Preferences standard (PNP). These preferences are not meant to convey private information such as medical history. Instead, they include information about how the user can interact best with a computer. The user's need for specific kinds of content, display features, or control mechanisms are recorded. This information can then be used to select or request appropriate adapted content, configure a visual display for easy reading, or locate resources that match the user's control requirements. The PNP specification provides a means to describe how a user prefers to access online learning content and related applications. Metadata is used to enable the delivery of resources in the user’s preferred manner. This information model that describes learning resources can be matched with the appropriate user interfaces, tools, and learning resources within an online learning environment. IMS Global has two tightly connected assessment standards, QTI (Question and Test Interoperability) and APIP (Accessible Portable Item Protocol) with the next version of QTI offering more accessibility improvements. The QTI specification and APIP (see next section) touch a variety of systems in a typical assessment ecosystem and enable the exchange of question items, tests, and results data between authoring tools, item banks, test construction tools, learning systems, and assessment delivery systems, and scoring administrative systems. Over the last three years, the QTI project has been focused on content portability. The current QTI 2.2 specification, with its many HTML5 elements and some Aria attributes, has enabled significant improvements over QTI 2.1 for semantic and perceptual visibility for assistive technology. The APIP standard provides developers with a data model for standardizing the interchange file format for accessible digital tests. “Item” in the title of the specification refers to question types (such as multiple choice, fill in the blank, essay, etc.). APIP adds accessibility constructs such as Spoken (or Read Aloud) and Braille information to QTI elements to enable delivery of a variety of accessible assessment content. 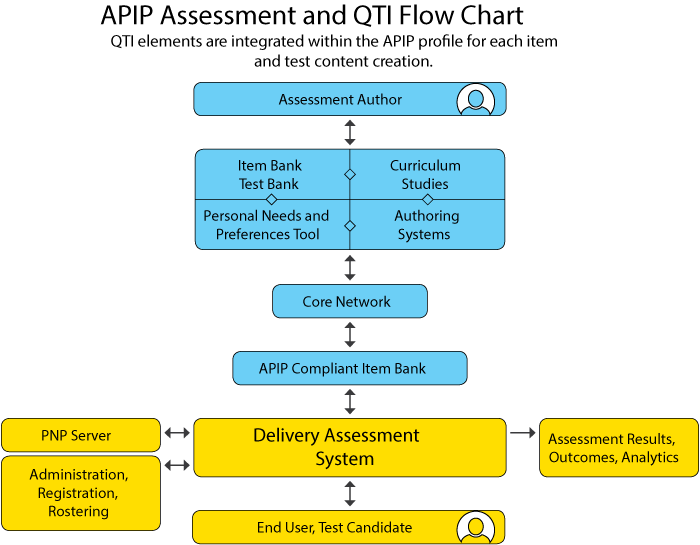 Caption: The assessment author delivers content working within four key areas: the test bank, curriculum studies, the PNP tool and the authoring system. The content is loaded to the core network (the Internet, the cloud, or a private network) and is processed through the APIP-compliant Item Bank to the delivery assessment system. The delivery assessment system then processes the content in the PNP server reconciling administration needs. Assessment results, analytics, and outcomes are produced for the end user, the test candidate. Improve interoperability by extending synergies with existing IMS Global specifications such as Learning Tools Interoperability® (LTI®), Caliper Analytics, and AccessForAll PNP. Currently learning analytics that can innovate and shape education are found in proprietary standards that reinforce the silos often found in education. Since many curricula ask students to work in multiple learning environments, there is a need for data that can be consolidated for a single view or cross-provider analysis. IMS Global released Caliper Analytics 1.0 in 2016 and is working on the release of Caliper 1.1. The purpose of the Caliper Analytics is to define a standard for enabling the collection of rich contextual data about learning interactions and a Sensor API™ for capturing and reporting this data. This work will enable learning environments to capture data from learning interactions and share it with other learning environments and consumers of learning analytics. Caliper’s Metric Profiles will establish a common format and labels for presenting learning activity data. While Metric Profiles provide a standard, they do not in and of themselves provide a product or specify how to provide a product. The IMS Global Learning Sensor API was created by Caliper to define basic learning events and to standardize and simplify the gathering of learning metrics. Caliper leverages and extends the existing LTI, Learning Information Services (LIS), and QTI standards thus integrating granular, standardized learning measurement with tools’ interoperability and the underlying learning information models. The EPUB for Education profile represents the adaption of the functionality of the EPUB 3 format to the unique structural, semantic, and behavioral requirements of educational publishing. EPUB for education was developed specifically for the education community. The main development has taken place over the last two years. EPUB for Education is currently in a public draft stage based on initial submissions by educational solution providers Pearson and O’Reilly. The EPUB for Education addresses gaps in EPUB3 such as navigating among multiple documents, skip ability, page numbers/pagination, semantic list-heads, to name a few. The profile also allows interoperability by using HTML5 to deliver IMS Global standards through its LTI, Caliper, and QTI services. The EPUB for Education Alliance is a confederation of standards bodies and organizations. Alliance organizations include BISG, DAISY, IDPF, IMS Global, and W3C. IDPF, as the governing body of the EPUB standard, advances ePub as the universal accessible interchange and format for digital publications. Its mission is to collaboratively develop and support the adoption and implementation of the EPUB for Education profile of EPUB 3. EPUB for Education allows the remix ability of content, an important feature when users want to customize the content structure. For reflowable content, the enforcement of well-structured content (section, heading elements) and structural semantics (footnotes, bibliography, etc.) is critical. It creates a predictability that improves efficiency for users of assistive technologies. This enables remixing and the ability to repurpose content. The EPUB for Education Distributable Objects specification defines how a publisher can identify reusable objects in the EPUB. The EPUB for Education metadata is based on schema.org educational properties such as audienceType, learningResourceType, and typicalAgeRange. It also has embedded accessibility properties such as accessibilityFeature: altText, printPageNumbers, and accessibilityControl such as fullKeyboardControl, and fullVoiceControl. Other accessibility features include content structuring such as logical reading order, use of WAI-ARIA markup and rich semantics. It defines a method for the creation and inclusion of dynamic and interactive components and allows the secure integration of shared educational scriptable components into XHTML Content Documents. Creating associations between distinct pieces of information currently lack a structured format for interchange between devices and people. User-created annotations cannot be shared or reused due to a deliberate "lock-in" strategy within the environments where they were created. The EPUB adaption allows bundling of collections of annotations and specifying target audience (teacher, age range, etc.). Annotations can be provided separately or bundled in the EPUB. Open annotations may replace embedding a long description in the HTML as the “description/annotation” could reside elsewhere, resulting in a decoupling of the long description from the HTML code. EPUB for Education currently defines content and Reading System Conformance requirements for LTI. All IMS Global standards are free to download and free to use. To claim conformance to an IMS Global standard, an implementing organization must complete the conformance certification process (which requires IMS Global membership). This Enhancing Accessibility through IMS Global Standards paper contains trademarks of the IMS Global Learning Consortium, including the IMS Logos, Learning Tools Interoperability® (LTI®), Accessible Portable Item Protocol® (APIP®), Question and Test Interoperability® (QTI®), Common Cartridge® (CC®), AccessForAll®, OneRoster®, Caliper Analytics®, and SensorAPI™. For more information on the IMS Global trademark usage policy see http://www.imsglobal.org/trademarks.